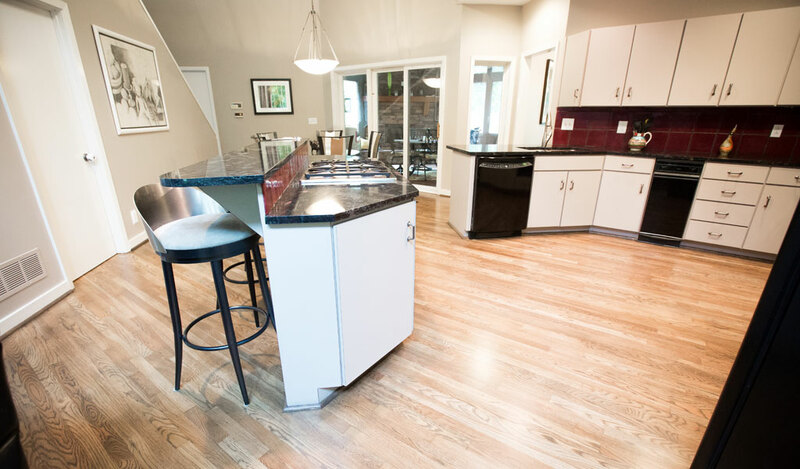 Providing residential hardwood floor refinishing throughout the Kansas City area. RippnFinish specifically specializes in hardwood floor refinishing. Therefore, we use top shelf products, have highly experienced refinishers, and strive for outstanding customer service! Our workers are friendly and keep a clean and organized work environment throughout the duration of the project. Communication is also a daily focus while on a project. Communicating with all interested parties during the job helps keep everyone on the same page. We also provide each customer with a hardwood floor care package. This includes a cleaning kit, felt pads, and instructions about maintaining their new hardwood floors, which will help, keep those floors looking like new. RippnFinish only uses the best finish on the market, which in our experience is Bona. For residential jobs that have no pets or children, we use Bona Standard Professional Hardwood Floor Finish. For homes that do have pets and children, we recommend selecting the Bona Industrial Professional Hardwood Floor Finish, which will keep floors looking great even with daily wear and tear. With the Bona finish, it generally takes about 3 hours, after each coat, before floors can have any kind of foot traffic. It takes about 48 hours of dry time before furniture can return to the floors after the final coat. For rugs, we recommend waiting about 7 days for the finish to fully cure/blend. We Do Not Refinish: Even though our company does an outstanding job refinishing hardwood floors, we do not refinish cabinets, doors, window/door frames, crown molding, tables, or chairs. I am 45 years old and have seen some redone hardwood floors in my days but this was beyond belief. The before and after pictures really can’t show you the true finish that was put on the floor. My friend was so pleased with the work that was done he has had the living room done since and plans on doing more rooms in the future. Travis is a man of his word, is always on time and the finished product is AWESOME! RippNFinish recently added about 700′ of new hardwood flooring, laced it into existing flooring, refinished it all in a dark walnut stain, and coated it with a satin industrial topcoat to protect the floors from heavy traffic and our dog’s nails. The owner, Travis, remained involved and committed until we were completely satisfied. Give Travis at RippNFinish a try – we’ll use them for our next project.